October 16th saw the 2010 Chimp Challenge take place. This is an annual event sponsored by City Tyres in aid of the Chimpanzee Sanctuary on Ngamba Island in Lake Victoria off Uganda. OnCourse plays a pivotal role in this as we make available our 4wd training site and press gang some friends into being event marshals. We also run the event for City Tyres with respect to organizing, monitoring and scoring. Everyone who plays a role in the set up and running of the event does so free of charge so there are minimal overheads that need to be covered. This ensures that all the money collected through sponsors, entrance fees and raffles goes straight to The Sanctuary. This year the amount raised was an incredible 75 million Uganda Shillings (30,000 USD). This money goes towards ensuring that the Chimps get fed and receive the necessary medical care throughout the coming year. 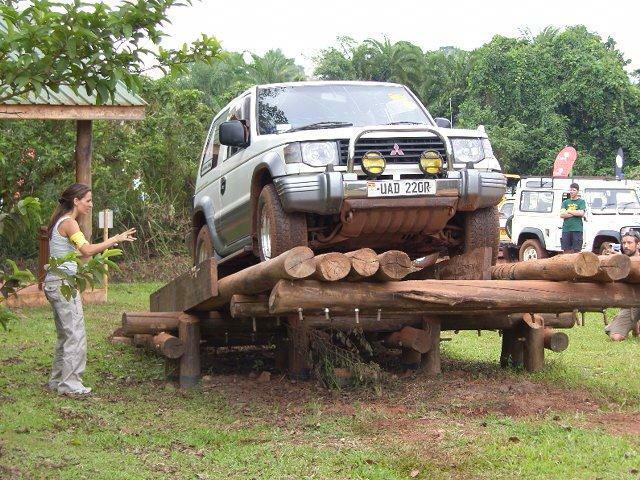 The Chimp Challenge is a 4wd competition that covers 5 events. Each event has its own prize and there is an overall prize for the team that has the best aggregate score. This year the overall event winner was team High Ratio. This is the second year running in which they have won the event which means if they win this year they get to keep the Chimp Trophy. So we are appealing to all interested in taking part in this year’s event to start preparing and practicing so that City Tyres doesn’t have to get a new trophy made. And good luck to High Ratio! A big thanks goes out to all the sponsors, competitors, marshals, spectators and Thomas, from team Nalubale Rafting, who made the event video for ensuring that 2010 was a good one for the chimps. And once again a THANK YOU to the City Tyres team for all the hard work they put in to getting sponsors, collecting entrance fees and setting up the facility to ensure that everyone who entered or turned up to watch were made welcome and comfortable. For instance, this year the catering provided by Javas. Which meant, we all had great food and cappuccino on tap!